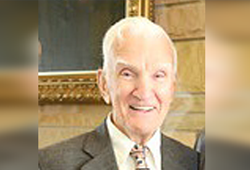 Walt has been a stalwart supporter of St. Pat's for over 70 years-ever since he enrolled at St. Patrick Academy on the near west side in 1945. Appreciative of the quality high school education that he received from the Christian Brothers, Walt has since tried to return the favor. Walt has certainly been generous to St. Pat's with his time. He has volunteered over the years at countless school functions, and has been a fixture at our two annual golf outings. He is a member of the Alumni Chorus, and is also a member of the school's Alumni Board. Walt has also been a generous donor, having reached President's Council status. Furthermore, trying to make it possible for those who came after him to also receive a quality education, he and his wife Mary have also included St. Pat's in their estate plans. As a result, Walt and Mary are automatically entered as members of our Anam Cara Society. Walt and Mary's simple guiding principle for their estate plans was to "help those who helped us the most." Walt recounts that "the classmates I met, the dear brothers who taught me through the years, the alumni I met through the years-- all had a profound effect. How do we give other boys that chance?" Walt notes that, while over the years many boys with minimal funds have come to the Christian Brothers looking for an education, few if any, are turned back. Walt is proud that over the years generous people have stepped forward to help those who would not otherwise be able to afford a St. Pat's education. "My wife and I are doing our part to keep that process alive," says Walt. "Giving to St. Pat's gives you a deep down good feeling. Try it. You'll like it". As a result of his generosity to St. Pat's with his time, talent, and treasure, Walt has been presented with the Shamrock Pride Award, and has been elected to the prestigious Saint Patrick Hall of Fame for Lifetime Achievement. As someone who has spent a lifetime giving to others, Walt is certainly an exemplary Shamrock!